If you want to have an everlasting love for chocolate and want to turn it into a delicious dessert in no time at all, then here is a simple and delicious white chocolate bread pudding recipe with white chocolate ganache that you can make at home and serve warm or cold. It is a classic bread pudding recipe and you cannot go wrong with it. – Cut the bread in small cubes or triangles and remove the sides. – Preheat the oven to 275F. – Put the bread cubes on a baking sheet and bake them for about 15 minutes until lightly toasted. – In the meantime, increase the oven temperature to 350F. – In a large saucepan, take the cream, milk, sugar and grated cinnamon. Heat on medium heat and bring to boil then let it simmer for 2 minutes. – Remove from heat and add the grated white chocolate to the hot mix. – Let the chocolate dissolve completely and stir until you get a smooth pudding. Set aside. – In a separate bowl, whisk the eggs and egg yolks together. – Pour the hot chocolate mix in the egg mix in a steady stream and keep mixing continuously. Your pudding for the bread is ready to use. – Take a 9×12 inch glass bowl and grease the insides with a little butter. – Arrange half of the bread cubes at the bottom of the bowl and pour half of the chocolate-egg mix on top of it. – Press the bread cubes lightly using your fingertips or a spatula to let the bread cubes soak the pudding. – Line the rest of the bread cubes on the top and pour the remaining pudding over them. – Cover the dish with aluminum foil and bake in the preheated oven for about an hour. – Remove the foil and bake for another 30 minutes to let the top get golden brown. – Bring the cream to the boil in a pan. – Remove from the heat and stir in the white chocolate chips. Keep stirring until smooth. 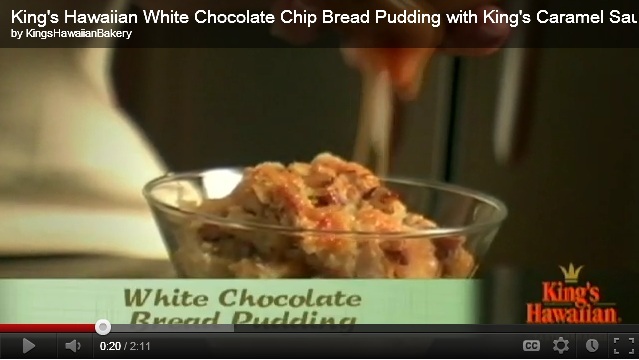 – Remove the bread pudding from the oven and serve topped with chocolate ganache and grated dark chocolate.